The world already knows how wonderful Philips’ Hue hardware is. And now, thanks to a slew of price reductions, you can make your home more intelligent than it already is by purchasing wonderful Hue hardware at a reduced level. One of the great things about the Hue range is just how extensible it is and how compatible it is with other systems. Not only can you add new bulbs and parts to the installation on an ad-hoc basis but you can also control the hardware via voice through HomeKit, Alexa, and even Google’s Assistant. That’s in addition to having the native Hue app for iOS and Android devices that allows immediate control and different customizations and scenes to be set up. The hardware is highly diverse and a pleasure to have in the home. 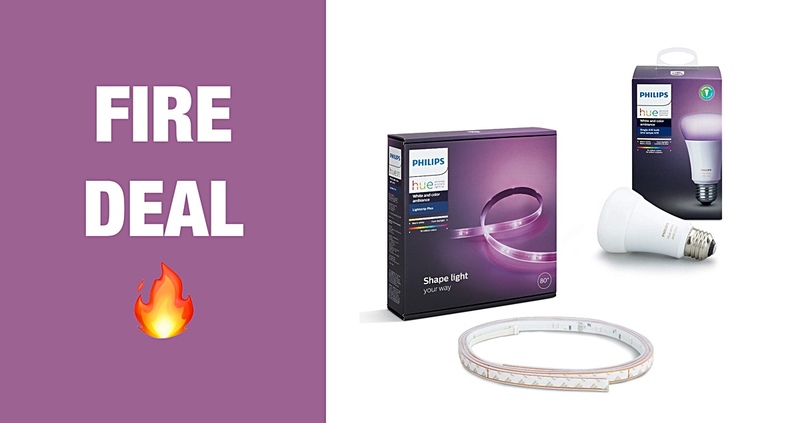 If you are ready to extend your existing Hue installation or to actually introduce Philips Hue into your life, then make sure that you take note and absorb the deals of the different pieces of kit. Remember that you actually need the Hue Bridge in order to connect this hardware to your home network. The Bridge isn’t included in any of these deals so if this is a brand new Hue setup in your home then you will need to take that into consideration. History has already shown us on multiple occasions that these types of deals can instantly be revoked and the price can rise back up to its higher level without warning. With that in mind, and in the interest of maximizing savings, make sure to go through the checkout process as quickly as you can to ensure that you get the very best value for money from your new Hue purchases.